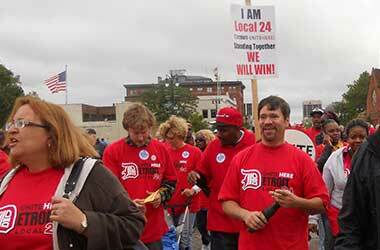 The on-going feud with the Detroit Casino Council and the three casinos in MotorCity, Greektown Casino and MGM Grand Detroit has finally come to an end as union members accepted the proposal put forward and agreed to sign the new contract. The feud between the casinos and the Detroit Casino Council was over the proposed changes in employee benefits, especially related to healthcare. The Detroit Casino Council which is made up of over 6000 casino employees were fighting hard to get more benefits without paying a higher premium, something that casino leaders were not willing to agree to. The feud escalated in October 2015 as the council threatened to go on strike and that prompted senior Detroit government officials to step in and request both parties to find an amicable solution to ensure that the city of Detroit does not suffer further consequences. Last week there were reports that the council had agreed to most of the terms put forward by the casino leadership team and this week council members decided to sign the new contract which will be valid for a period of five years. The president of Unite Here Local 24 and bargaining committee leader confirmed that the employees from these three casinos were a lot more happy with the proposed changes and that the overall vote they received showed 76 percent were okay with the new contract, 85% okay in favor at Motor City and 95% in favor at Greektown. Greektown Casino said in a statement. We can now collectively move forward continuing to build a successful business for the benefit of our team members, our company and our Detroit community. The council fought long and hard on behalf of casinos employees within the state and appears to be satisfied with their results. MGM Grand employee and VP of Unite Here Local 24 was happy that the new five year contract was finally signed and stated that it will provide casino employees with a better future, address over hiked healthcare costs and during the course of the next five years will review and raise the fixed fees accordingly. The Unite Here Local 24’s website states that the unions finally managed to get the team to continue with the Blue Cross/HAP health plans and casino employees will not have to pay an additional costs.